The Brown Stonewares of the Yixing Kilns. The Carol Potter Peckham Collection, p. 65, fig. vi, center. Art Gallery of Greater Victoria and Vancouver Museum, The Brown Stonewares of the Yixing Kilns. The Carol Potter Peckham Collection, 1992. Refer to the footnote for lot 641 for a discussion on enameled Yixing bottles. It is extremely rare to find an enameled Yixing bottle decorated with a Buddhist lion. However, there is an example of the same shape, and with very similar treatment of the ruyi-head-shaped clouds and flames, but with a single flying dragon, illustrated by B. Stevens, The Collector's Book of Chinese Snuff Bottles, no. 348. That bottle most certainly comes from the same workshop and probably the same hand as the present bottle. 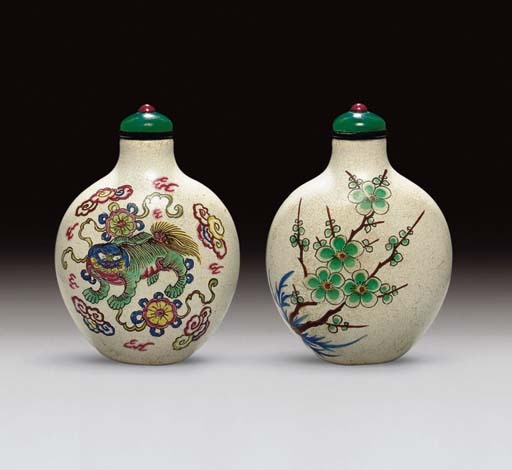 With both enameled and plain Yixing bottles, it was commonplace to enamel the inside surface. Shifting connoisseurship among snuff-takers in the mid-Qing period led to a preference for shiny interiors to prevent the loss of moisture from the snuff, which is probably why many Yixing enameled snuff bottles of the period were enameled inside as well.